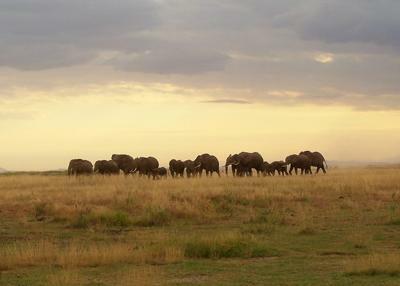 I love the early morning light in Kenya. We saw a herd of elephants walking across the plain with a golden sky behind them and at first I was too awestruck to take a picture. It was very beautiful. As I was leaving for the airstrip to head over to the Mara Mt. Kilimanjaro, shy all week, finally decided to show herself. As my driver and I headed down the road it was one group of animals after another. Zebras and Mt. Kili! Giraffe and Mt. Kili! Then, yes! 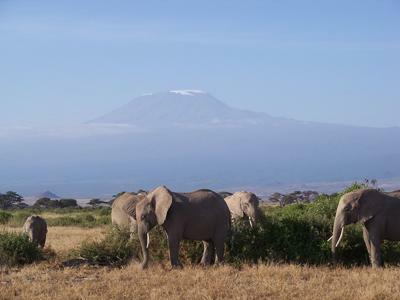 Elephants and Mt. Kili! That's the pic everyone goes to Amboseli to get and I consider myself very lucky to have done so. I hope I got the spelling correct. Thanks for your pictures and the way you described them was awesome. For sure we never know when the best picture will happen but you caught it bigtime and lots of smartie points to you. I am sure you had a wonderful time in Kenya and hope you will think about returning. As you know its not just the animals but the overall experience and I do hope that this fulfilled your ideas. You may be thinking why you are getting a personal response but this is the way we do it and its great to to share with the rest of the world. Your pictures are now shared worldwide and thanks for that.